To receive your full cable lineup, your TiVo® Premiere box requires the installation and activation of one Multi-stream CableCARD (M-card). Many cable companies require the CableCARD to be setup by one of their installers, but if self-installation is an option from your cable provider these tips should help you get the CableCARD running smoothly. You may use a CableCARD from an earlier generation TiVo DVR, but it must be a Multi-stream CableCARD. Single-stream cards are not supported in TiVo Premiere DVRs. Simply move the M-card CableCARD from your old TiVo DVR to your new TiVo DVR and follow the guidelines below. – When going through guided setup you can choose to install a CableCARD at that time or to install at a later date. If you don’t have the CableCARD handy, choose ‘install at a later date’ and finish guided setup without the CableCARD. You’ll be able to watch all of your analog cable channels, but you’ll need get the CableCARD to view any digital channels. Once you have the card, simply slide it into the DVR and the menus to configure the card will automatically display…there’s no need to run guided setup again. 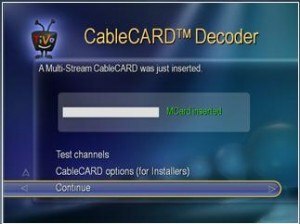 – When you are prompted to insert the CableCARD, the decoder screen (shown below) will changes to an MMI screen (also shown below) after the card has been inserted. 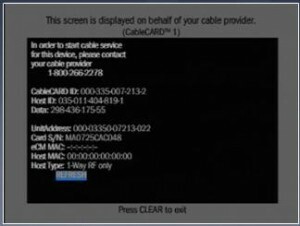 That MMI screen has the information you need when calling your cable company to activate the CableCARD. Note: It may take about a minute for the MMI screen to appear. – When you call your cable company to activate your card, they may also refer to this process as pairing the CableCARD or binding the CableCARD. All of the information they’ll need is located on the grey and black CableCARD MMI screen – including the phone number to call to have them help you. Typically they’ll ask for the serial number (Card S/N), the Host ID, and sometimes the ‘Data’ identifier. – If you subscribe to multiple tiers of cable service, check a few channels in each tier before getting off the phone to ensure the correct cable packages have been enabled (for example, HBO). – After the card is successfully activated you can begin watching live TV. It may take a few hours to download the full program guide for the upcoming weeks. – If your cable provider requires that they install the card, set up the TiVo Premiere box a day or two before your installation appointment. This will allow TiVo Premiere to connect to the TiVo Service and download any software updates that are available. How about some tips on what to do when a Kabletown installer acts dumb and pretends the CableCARD (TM) doesn’t work? will a dvb-t tuner card work for the tivo premiere n australia at all?